1897 My grandfather John Francis George Letts (2.3) was now living in Mozambique. He was working for the Eastern and South African Telegraph Co. Ltd. as Director of their branch in the Capital, Lourenzo Marques known nowadays as Maputo. Lourenzo Marques. 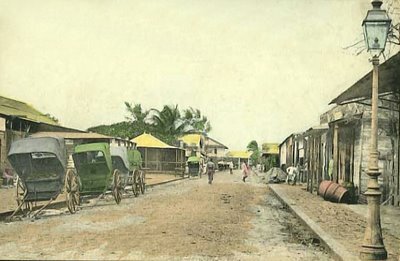 Two views from contemporary postcards. The top one was taken in the customs enclosure and the top one shows the harbour. Both places must have been well known to my Grandfather George Letts (2.3). On the 4th of July during George Letts' (2.3) tenure as Director of the Eastern and South African Telegraph Co. Ltd. in Mozambique, a fire occurred in one of the Portuguese naval depots. George (2.3) was one of the first on the scene and, among others, was actively involved in helping to put it out. For his actions he was warmly congratulated in a letter sent to him by the Governor of Mozambique. His act had been one of, 'self-sacrifice and generosity' and had involved 'great risk'. 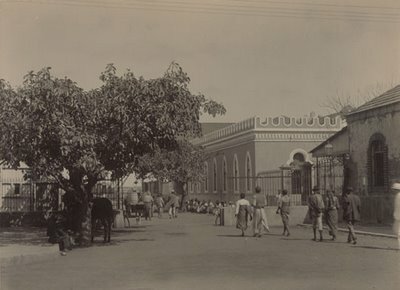 I am not sure if it was before or after his visits to Zanzibar and Mozambique that George (2.3) was sent to Aden by the Eastern Telegraph. But I know he was there for quite a while. 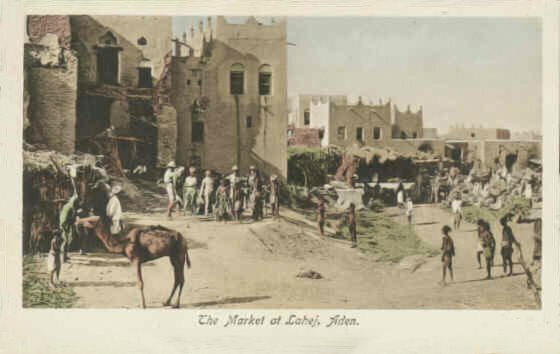 Three contemporary photographs pf Aden. 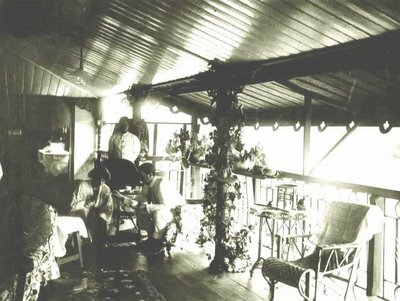 The top photograph shows the staff club which George (2.3) must have visited frequently. 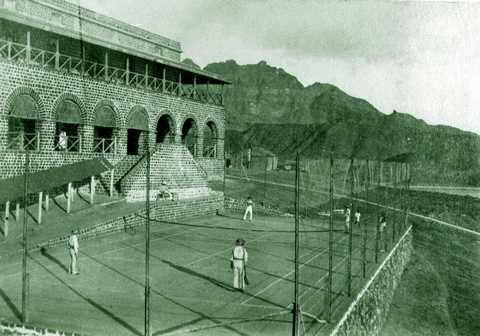 The middle one shows members of the Eastern Telegraph Company playing tennis in their own private courts. The bottom postcard shows Aden’s main market which was called Lahej. Electricity arrived in Gibraltar that year but it would take quite a while to phase out the old oil and gas lighting. On the 27th of September Joseph Chipulina's (1.1) brother Felipe was born. He was my uncle but I never knew him. 1898 In Gibraltar Bishop Canilla died. He was recognised as a friend of the poor and of the Jews. He had lived an ascetic life and had apparently also been respected by the Protestants. At his death there were 1 900 primary school places on the Rock. In May a tunnel through the Rock to convey materials for the dock work was completed. 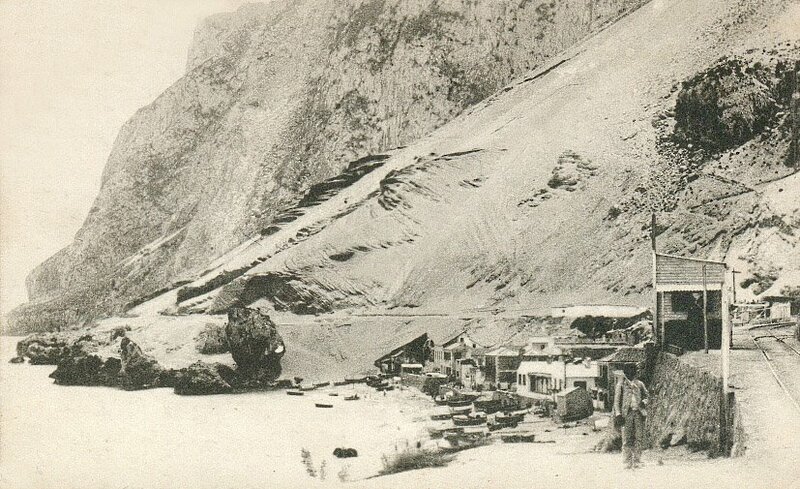 Catalan Bay .This is turn of the century postcard. On the far left one can just make out the special railway line built to carry material for the construction of the docks through the newly built tunnel. Meanwhile the working conditions of the coal heavers continued to deteriorate. Many of these men were forced to work during the day as navvies to supplement what little they earned at night heaving coal. Sixteen hours a day of heavy labour for very little pay was commonplace. That year they went on strike once again. The dispute, however, was neither about working conditions nor about pay levels as such. The main concern was the fact that they were paid in pesetas and the Spanish currency was dwindling in value as a result of the Cuban War. The workers wanted to be paid in Sterling. The owners countered by offering a 25% rise in wages but the workers found this unacceptable as the peseta was devaluing rapidly. The owners next move was to import Spanish labour from Algeciras. Violence erupted in Main Street and according to the local newspapers 'several merchants were ill-treated and severely injured.' The police found it difficult to cope and the Governor was forced once more to call out the troops. Eventually Biddulph did a U-turn on his predecessor's non-interventionist policy. He forced a compromise on both parties and 50% of the workers' pay was indexed to an exchange rate published daily by the Gibraltar Post Office. It is ironic that these grossly underpaid and overworked men may have ended up with the first index-linked pay in the world. Meanwhile George Letts (2.3) was still hard at work in several exotic locations including a visit to Zanzibar and Diego Suarez. 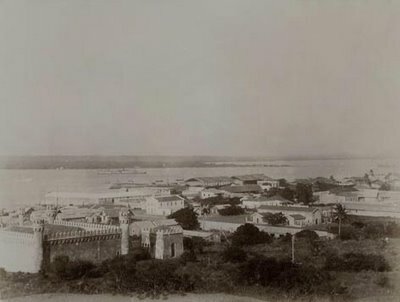 Zanzibar and Diego Suarez in the late 19th century. On the other side of the world the Spanish-American War had begun and although unconnected to this event it was probably around this time that George (2.3) returned to Gibraltar. Not long after he met Maria Luisa Gomez (2.4) at a party aboard one of the Eastern Telegraph Company ships that shuttled between the two cable terminals of Gibraltar and La Coruña. George (2.3) had become a member of the Calpe Rowing Club and was known in Gibraltar as 'El Ingles Andaluz'. Apparently he played the guitar. I am not sure how well he played but his instrument remained in the family house in Main Street for many years after his death, until one day it was given to a sister of charity who asked for it for an old man who loved the guitar but didn't own one. My grandparents George Letts (2.3) and Maria Luisa Gomez (2.4).I think these were taken before they were married. 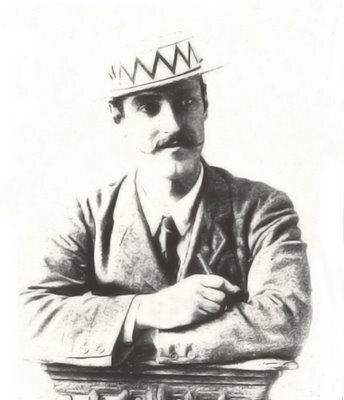 George (2.3) is wearing a Calpe Rowing Club Panama hat and a great moustache. Maria Luisa (2.4) looks as arrogant as ever. 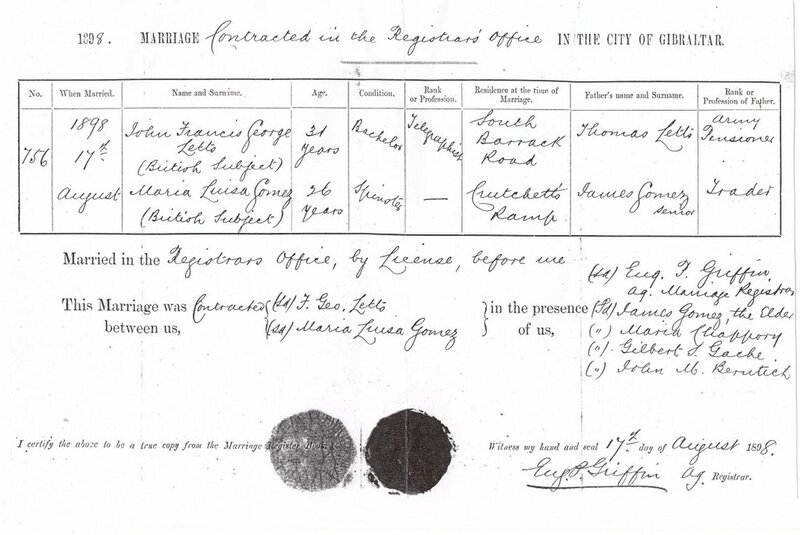 On the 17th of August George (2.3) married Maria Luisa (2.4) in the Registrars' office in the City of Gibraltar. 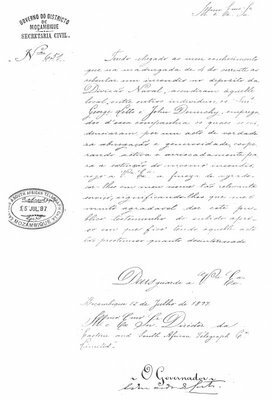 The Church, in the person of the parish priest, Father Dodero, had regretfully informed them that they could not be married by the Church unless George (2.3) , who was a Protestant, signed an undertaking to bring up his offspring in the Catholic faith. George (2.3) , who must have been a rather casual Protestant, was quite agreeable, but true to character, Maria Luisa (2.4) considered the request an impertinence and refused to allow her future husband to do any such thing. If Father Dodero wouldn't marry them they would go to the Registrar's office: which is what they did. My grandparents, George Letts (2.3) and Maria Luisa Gomez (2.4). 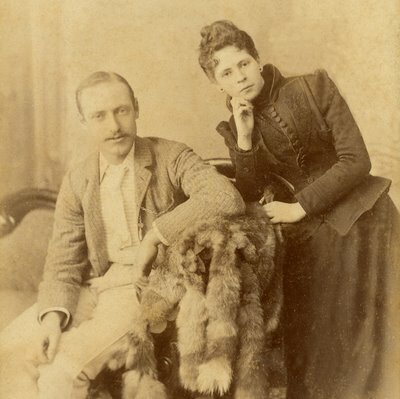 The photo was taken in Tangier probably just after they had married. Despite the carefree pose Maria Luisa was not amused. The marriage certificate records her age as 26. In fact if her birth certificate is to be believed she must have been 28. Perhaps she was trying to make out that she was younger than she really was. George (2.3) was 31 years old. Thomas Letts (3.5) and his wife Rosa (3.6) presumably took part in the wedding festivities as they were both still alive. Diego José Gomez (3.7) was definitely there as his name appears as one of those present at the ceremony. 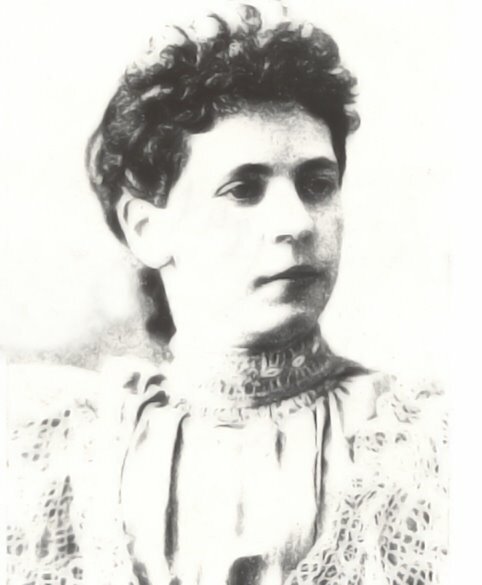 Magdalena (3.8), of course, had been dead for two years. 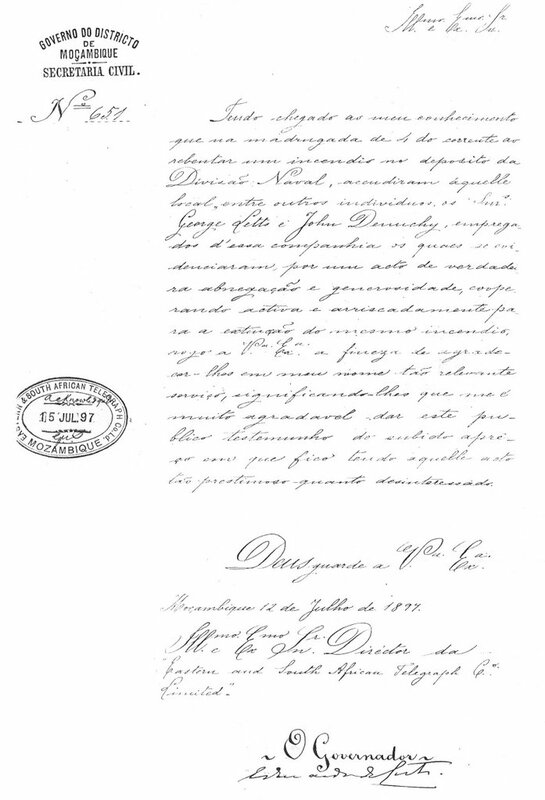 Note Maria Luisa’s (2.4) age is given as 26 whereas in fact she was 28.